Faraway Press: The Online Home of John Jackson Miller: Lost Tribe of the Sith #3 now online! And it's online! Star Wars: Lost Tribe of the Sith #3: Paragon is online now for free download. Let's catch up with those crazy castaways from the good ship Omen as they scheme, plot, and make lightsabers out of coconuts! You can find the simple PDF at the official site — and you can get the Kindle download from Amazon here. You can get the Sony ereader file here — and the Barnes & Noble version here. A veritable feast of digital choices! 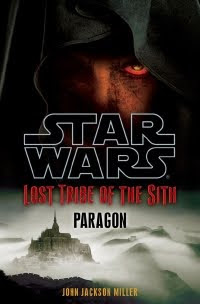 It's a fun — if extremely dark — episode that ties together several of the threads between the Golden Age of the Sith period and the later Fate of the Jedi novels. And Seelah's one of the vilest characters I've ever written — I felt like I needed a bath afterwards! The download also includes a nifty preview of the fourth Fate of the Jedi novel, Backlash, by Aaron Allston. Enjoy — and drop me a line, And come back tomorrow for some really big news... quite the biggest news of my year. Hey! Loved this issue, especially since it detailed more upon my favorite Star Wars character of all time: *drum roll* Ludo Kressh! I love how you subtly tied in the Gauntlet of Kressh the Younger in this, and now I want to know more about what happened with Kressh the Younger even more! Great job tieing up the loose ends with the Red Sith; I never thought I'd feel sorry for them, but boy were they handed a cruel fate! Keep up the good work, love your comics and this was your best eBook yet! P.S. doubt you'd care to know, but I was working on a short novella about Ludo Kressh, but haven't been able to get back to it in some time. This gives me quite a few new ideas for it, again, love the work. Keep it up!